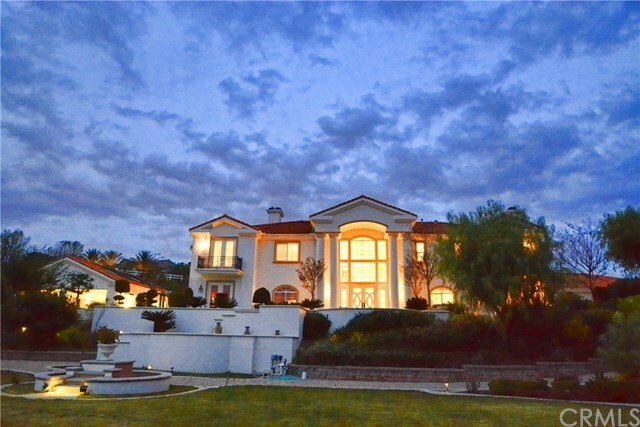 Amazing custom showcase home located in the prestigious 24 hours guard gated community "The Country" in the most desirable neighborhood of Diamond Bar. This elegant Mediterranean estate offers 5 exquisite bedroom suites, eight bathrooms, and everything you need to entertain with luxury. Enriching architectural features inside include extra high ceilings, high quality materials in all cabinetry and countertops, and dozens of large windows. An amazing family room features a comfy fireplace, built-in cabinets and bookshelves, and wet bar. The expansive gourmet kitchen and separate Chinese wok kitchen have modern stainless steel appliances, solid granite countertops, and tastefully designed cabinets. While many homes offer a small âafterthoughtâ for a downstairs office â this one presents an impressive library study with masterfully done wood paneling and cabinets that embrace another stylish fireplace. The living room off the front foyer also has its own elegant fireplace and plenty of room to decorate and display artwork. The exterior is designed to embrace spectacular mountain view and city light view this home delivers a getaway spa experience with a clubhouse enclosed swimming pool & spa, dozens of exotic plants along winding walkways, and trees that add depth and character. Plenty of space to play basketball, badminton, or to simply walk the grounds of the 4.9 acre natural paradise.